It was set to premiere at TIFF, but not anymore. 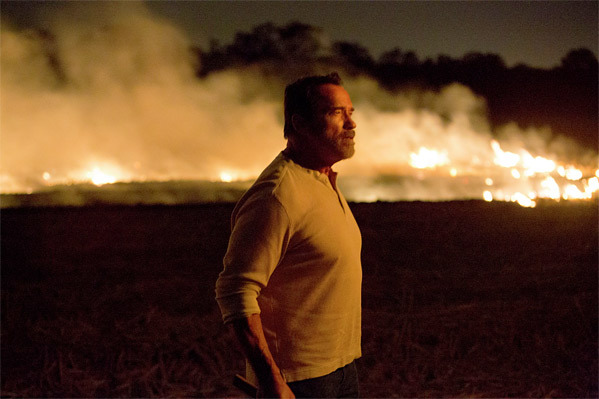 Lionsgate has announced that in a "preemptive deal prior to the start" of TIFF, they've acquired the release rights to Maggie, an "apocalyptic thriller" (read: zombie movie) starring Arnold Schwarzenegger, Abigail Breslin and Joely Richardson. The film was set to premiere at the Toronto Film Festival late in the fest next month, but with an early 2015 release planned, they've decided to pull it from the fest (the film's original listing is now gone). Whether this upsets you or not, the good news is that it will still be released in theaters… eventually. Some photos from the film below. "We're delighted to continue our relationship with Arnold Schwarzenegger, who turns in a performance that marks a dramatic departure from his action persona, and partner with our friends at Lotus Entertainment on a film that will resonate with thriller aficionados everywhere," stated Lionsgate's COO Steve Beeks. Bill Johnson and Jim Seibel, Co-Chairs of Lotus Entertainment, producers on the film, added: "Maggie takes the zombie genre in exciting new directions, and it offers something for everyone – star power, horror, suspense and riveting performances that will keep moviegoers on the edge of their seats." Silver Reel and Gold Star Films financed the film which Lionsgate will release theatrically in North America in early 2015. From the press release: The film tells the story of a deadly zombie virus that has put a plague on the world. When Maggie, a vivacious young woman becomes infected, her father brings her home to let her be with their family. As Maggie’s condition worsens, their relationship is tested, a father’s love holding on stronger than the disease. This heart-wrenching twist on the zombie apocalypse puts a human face on an inexplicable horror. Stay tuned for updates and a trailer before the release next year. We're definitely curious about this. There are films playing at TIFF, which open weeks or even days after the screening. I don't see why Maggie couldn't have still premiered at the festival, even though Lionsgate has now bought the rights and plans to release it next year. I am very interested to witness Arnold's performance in this. I know he has it in him to reign in the cheese. this has very much my attention but Arnold playing a dad with no ak47 on his Lap is asking for trouble because he can't act! But hey I like Zombie movies so I will watch it anyway! Saying Schwarzenegger "can't act" is a pretty empty statement. Even his action films had many moments of subtlety and nuance that a true non-actor couldn't have pulled off. I don't think a slower, more dramatic role with a supernatural connection, is at all beyond him. That said, the plot itself sounds disturbing. I am very curious about this movie even if I think swarzenegger can't act. I can look beyond that. But my opinion stays. It's a monument of action movies but realy no actor. After 30 years of Hollywood you still his hear austrian accent, says enough for me.